So far Andrea Patel has created 117 blog entries. Courage. Love. Alaska. These have been the three topics that have dominated our classroom recently. 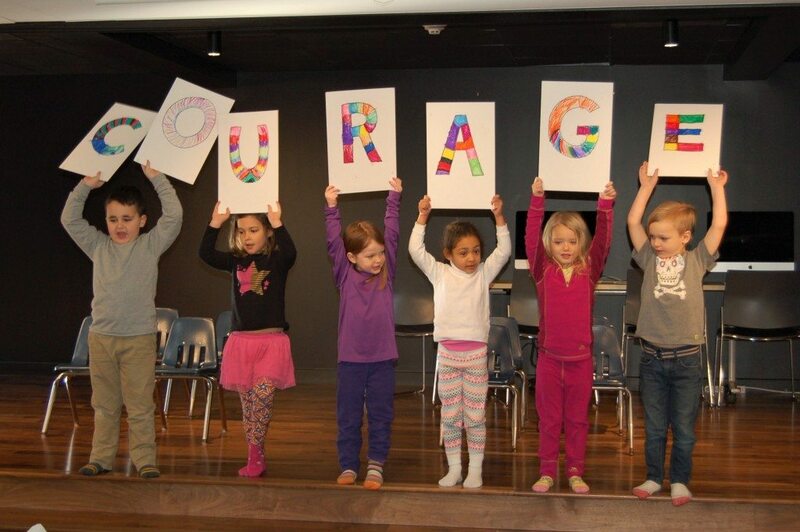 First, courage – that was learning about the life and work of Martin Luther King, Jr., Ruby Bridges, and Rosa Parks. And about Bobbi Gibb, the first woman to run the Boston Marathon. And also about the lives of 26 other important and courageous woman leaders, from an alphabet book called Amelia to Zora. These stories naturally led into conversations about our own lives and times when we each needed to be brave in particular situations. Drawings and writings followed. We’ve also learned two poems on courage, which we will present at the soon-to-be rescheduled-because-of-weather Courage Assembly! And then love – Valentine’s Day! 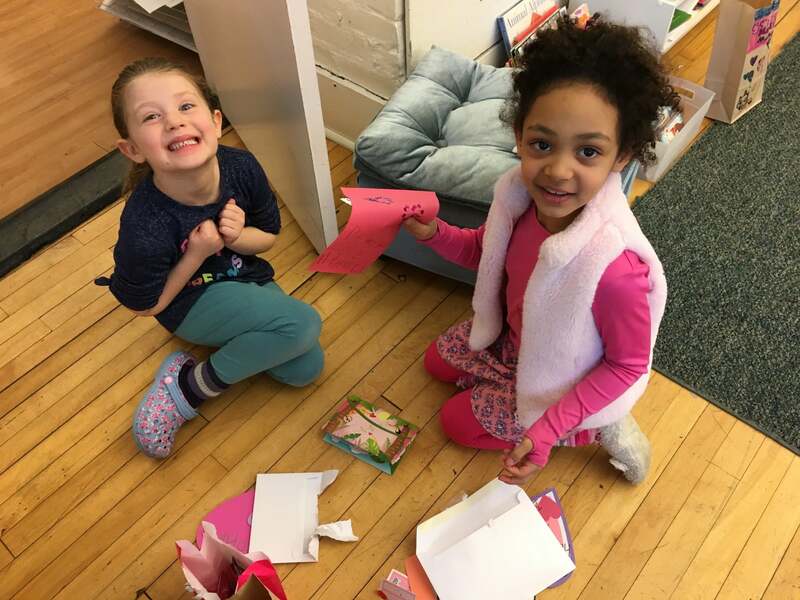 We had fun making valentines for families and for our fifth-grade peer readers. Thanks to all who sent in goodies for the party! We learned that the Magic Valentine Potato (from a story by Daniel Pinkwater) is real! And he (she? it?) brought potato chips for us to share with our fifth-grade friends – how nice! 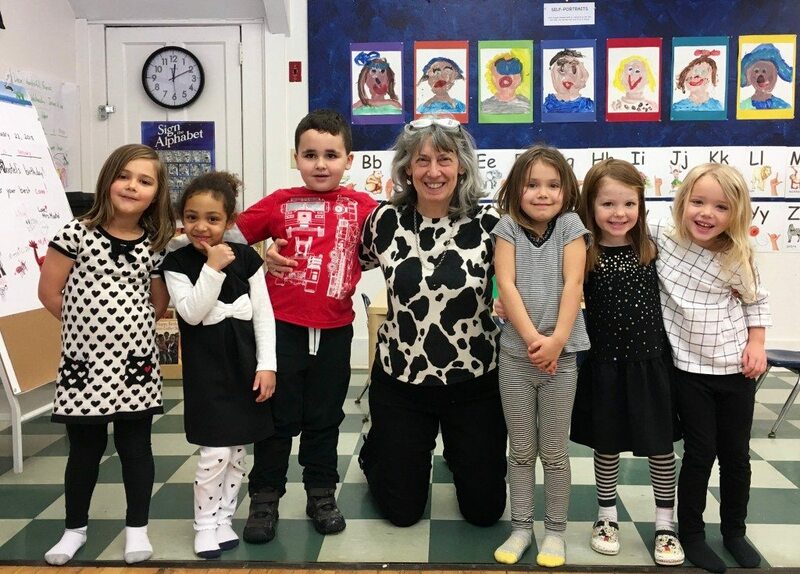 Then we celebrated Alaska Day – so much fun! Starting with photos of my own trip to Alaska last summer (which I LOVED) included sharing the photo of me doing a polar plunge in 38 degree water (which took all of my COURAGE), the day moved easily between outdoor and indoor activities, all related to Alaska and/or winter. 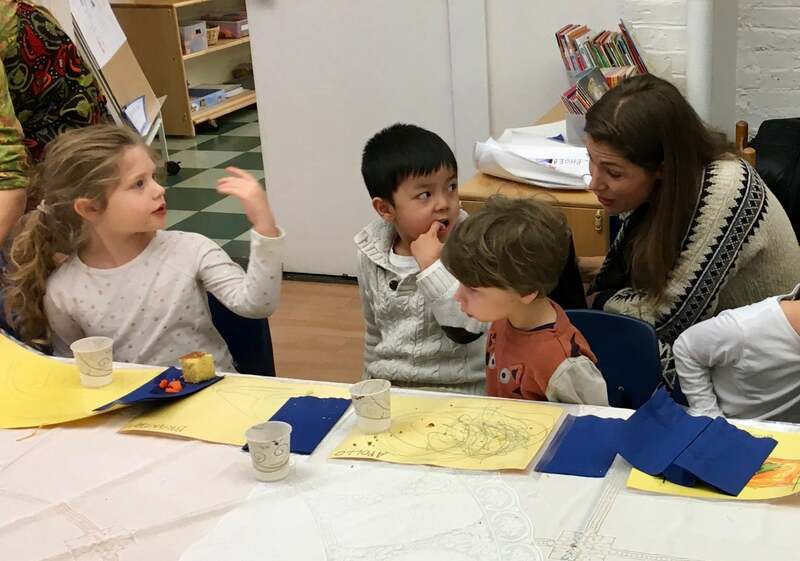 Ms. Doherty and Ms. Heddinger treated us to a delicious blueberry pancake lunch (blueberries being one of the fruits that grows well up there). It was a terrific day! And then it was The 100thDay of School! Truly, the fun has not stopped all January and February! 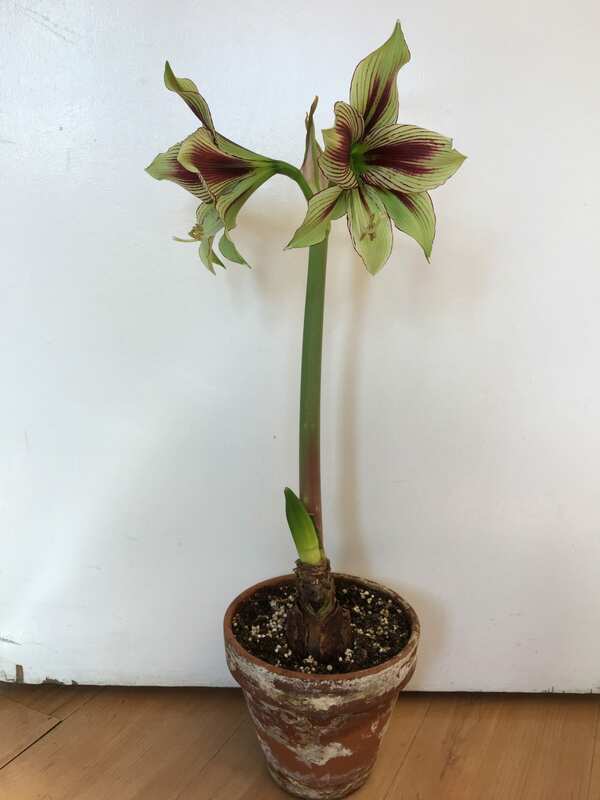 And our amaryllis bloomed! We painted it! Regular work continued, also, in between all of these special events. 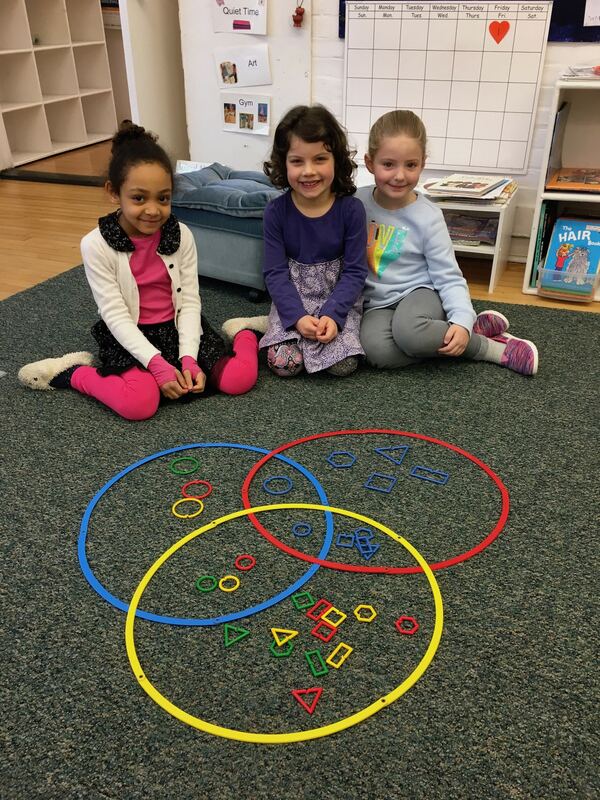 Each child is making their own alphabet book, and each has now completed a Venn diagram using colored pasta. These culminating projects hang on our wall. 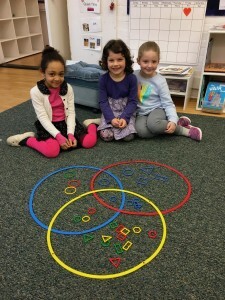 As a group, the class did wonderfully well sorting by one and two attributes. Some even challenged themselves, sorting by three attributes, with great success! More classroom fun. Enjoy the photos! “Keep fighting!” said the teacher. Odd words, indeed, for me to say, but I meant them. I needed more fighting! Now, before you think I’ve lost my mind, let me put this into context. Last week, we were in the middle of a rehearsal for our play, The Land of Many Colors. In this story, purple people, blue people, and green people live separate, happy lives until one day things fall apart, and WAR begins among them. How do we act this out realistically, but safely? Well, at first the children play-fought with lots of smiles and laughter. But it didn’t really look like war. What they needed to learn was to “fight” without smiling, to fight without actually hurting anyone, and also to fight without making a sound, so that the story’s narration could continue. The play, performed last Thursday at the PS-LS Cooperation Assembly, was a success. The children had learned admirable self-control that they used while “fighting.” And then, what fabulous cooperation they displayed as they rebuilt the ruined world they had made. 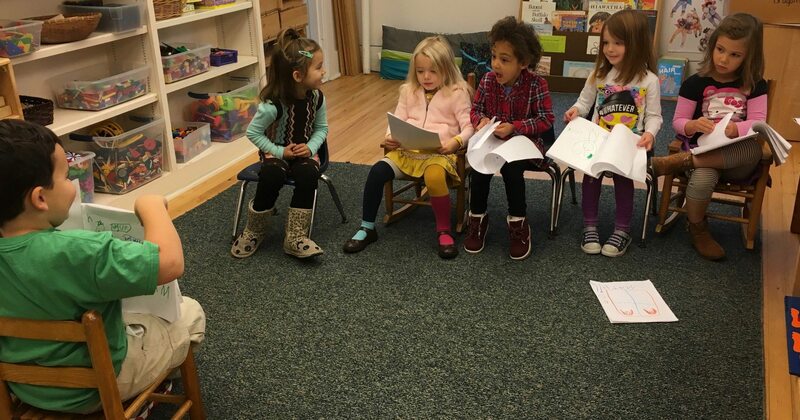 The class had a lot of fun practicing and performing this play, and did a great job! Big thanks to all who send in blue and purple and green clothes, food, and stuffed animals. And extra thanks to Alex, who videotaped it! In addition to our play, we’ve learned how to write the numerals 0-9, and have begun learning lowercase letters (now up to j). We’ve been talking about the idea of peace – what’s happening when you feel peaceful? And what does it mean to be a peacemaker? Writings and drawings now accompany both of these ideas, so come and see our bulletin boards. Some special gifts are being made in the classroom, and they will come home next week. I hope you enjoy them. It’s almost Thanksgiving, and boy, am I thankful! 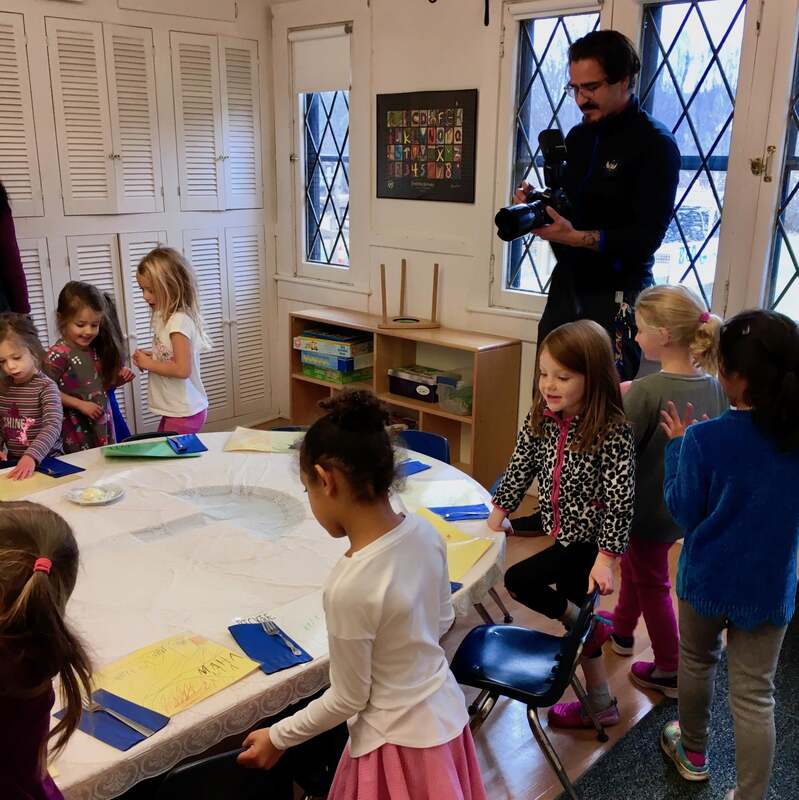 This class couldn’t be any more fun to teach – really! They’re inquisitive, smart, thoughtful, caring, argumentative (on occasion! ), chatty, and kind. They love to learn. They love to play. They like pretty much everything that we do in school. And October sped by so quickly. 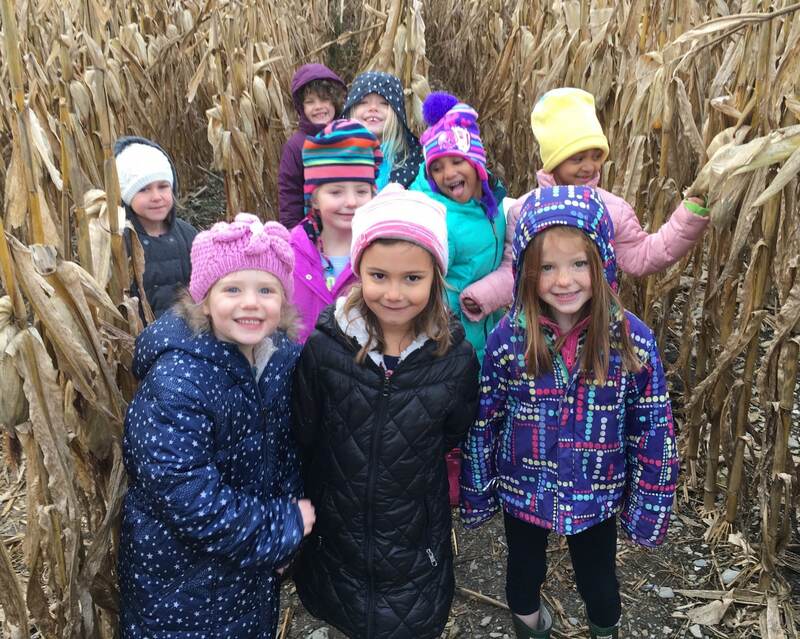 Highlights: our trip to Ioka Valley Farm was super fun. Although the weather was a bit raw, all had a great time! We’ve lately been doing an author study on Karma Wilson, who wrote the Bear Snores On series, and also enjoying many books by Cynthia Rylant. 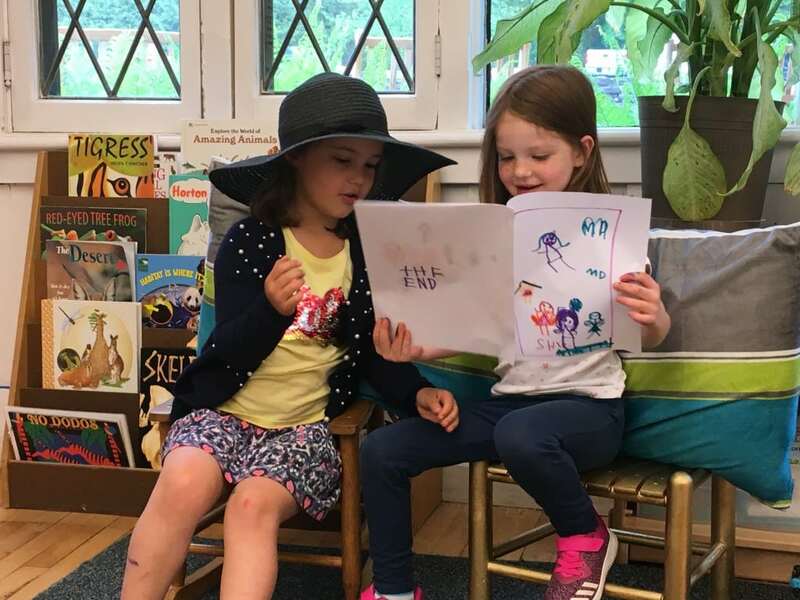 Wilson’s books are written with terrific rhyme and rhythm and humor, and they offer a great contrast to Rylant’s, as her style is softer and her content more reflective. In addition, we’ve read books about Thanksgiving and listened to Native American stories at rest time. Each child has written and illustrated something for which they are thankful – these will be displayed starting next week, so come and see. 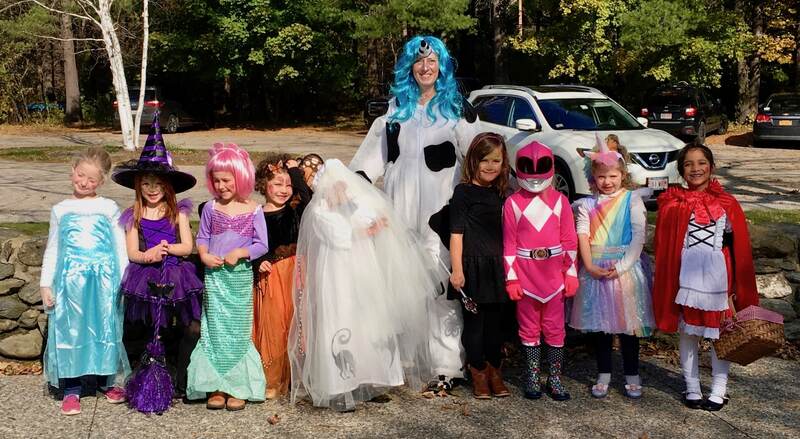 The children’s Halloween, Who Do You See? books have gone home, and their completed math Pattern Books are in today’s backpacks. This class continually surprised and delighted me with their ability to create complex patterns of all sorts, using unifix cubes, dots, and beads, as well as their ability to draw lively ghouls, ghosts, and goblins! Cooperation has been our overarching theme this fall. 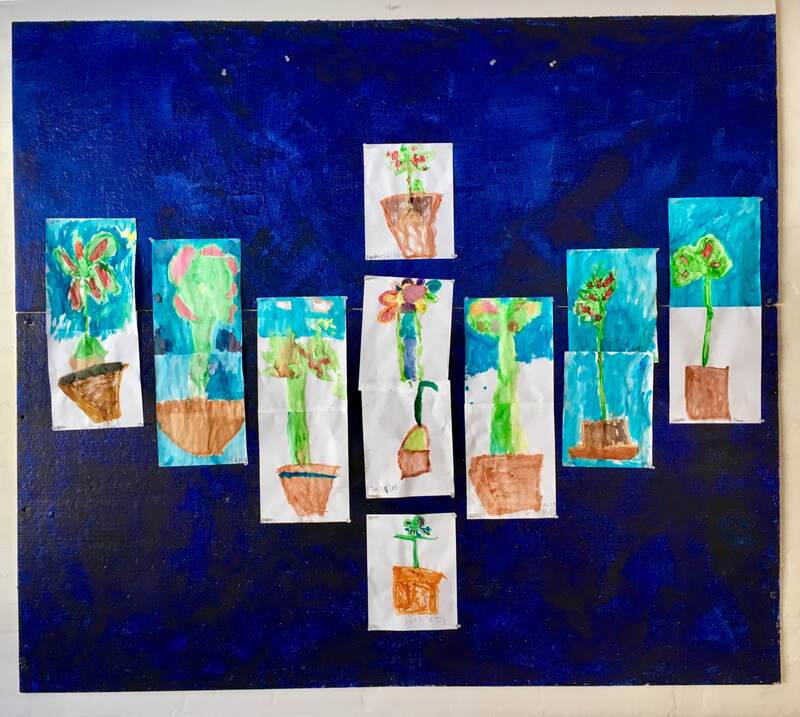 In a few weeks, we’ll gather at a small assembly with B2-Grade 3 and present a class project. In the meantime, we practice sharing and working together daily, as evidenced by our Friendship Lunch last week! This year we had 30 (!) 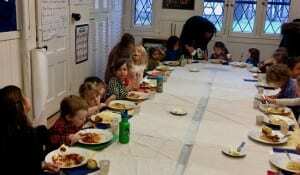 children seated around the table – it was so great to see so many little faces together. 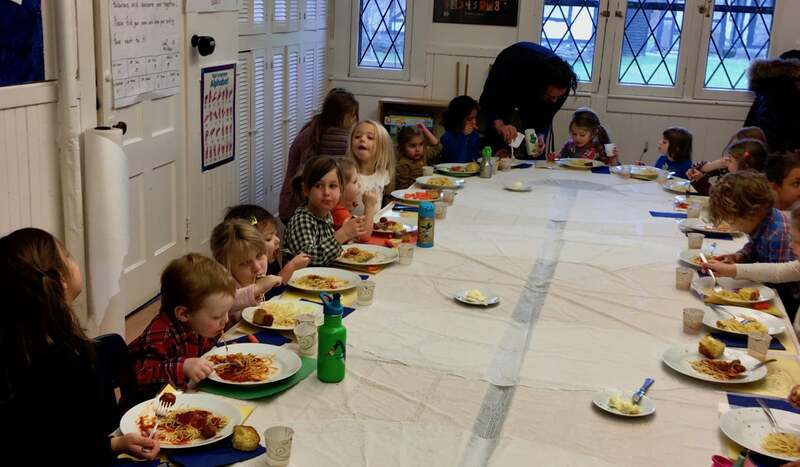 All enjoyed spaghetti, meatballs, cornbread, homemade butter, and chocolate-covered pretzels. A HUGE thank you to all the parents, from all the grades, who came in to help! October also held our Parent-Teacher conferences. These are always a valuable time to talk in depth about each student. Thank you all for making time to come and meet with me. I offer my thanks for your support this year, and I’m grateful for all the joy your children bring to each other and to me. Have a wonderful Thanksgiving! 18 days into the year! It’s just turned from September to October, and our class has spent a total of 18 days together. Not very much time, really, and yet, what a lot we’ve accomplished! We are a class now; no longer a collection of individuals. What bonds us, what is that magic glue? That’s easy to answer. Talking, singing, and playing games together. Learning to look one another in the eye and listen. Helping each other. Showing compassion when a classmate is sad. Taking our first trip together to Magic Wings (more on that later!). Sharing. This “coming-together” in these early weeks is so vital, and sets the stage for happy and productive learning for the rest of the year. Its importance cannot be understated. Meanwhile, our classroom has been full of activity. Everyone has come up with a school “Hope & Dream,” and from these we’ll develop our classroom rules over the next few weeks. In addition, everyone has completed September portfolio art, Four-Square, and Weekend News. Each has made a self-portrait – these will be hanging up shortly – come and take a look! 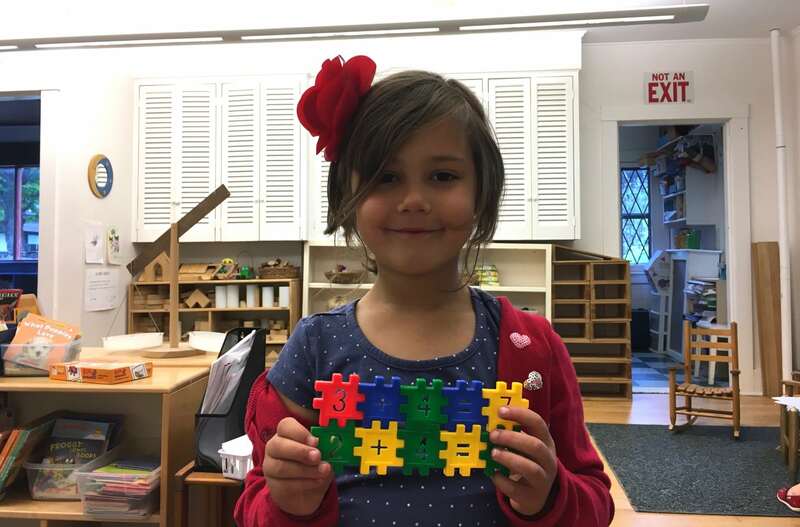 Our focus in math is on shapes and patterns, and work with pattern blocks, pegboards, and beads continue to be popular choices.Here are some of their creations! 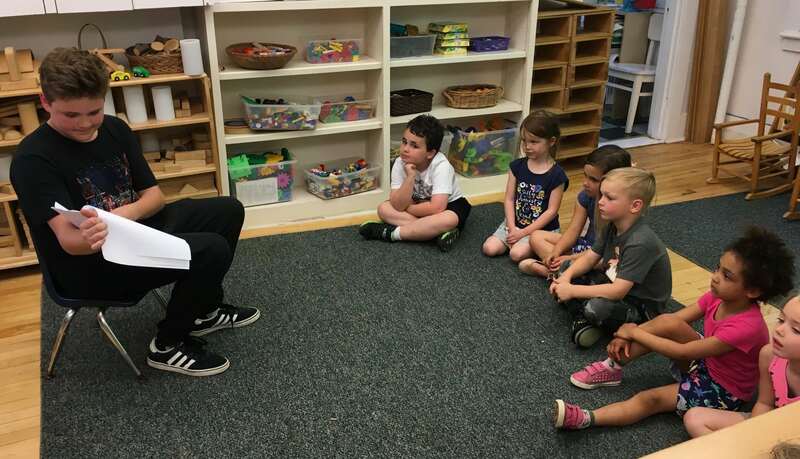 More: we’ve also written class books together and had “Mixer” with Grade 1-2. We’ve gone to the Library and shared stories with the 5th grade. Dr. Segar came to our room and taught us some fun songs. Our twice-monthly Community Circle, with two-year-olds through third grade, have been a great time to gather as a larger community, to play games, to sing, and to hear what’s going on in other classrooms. 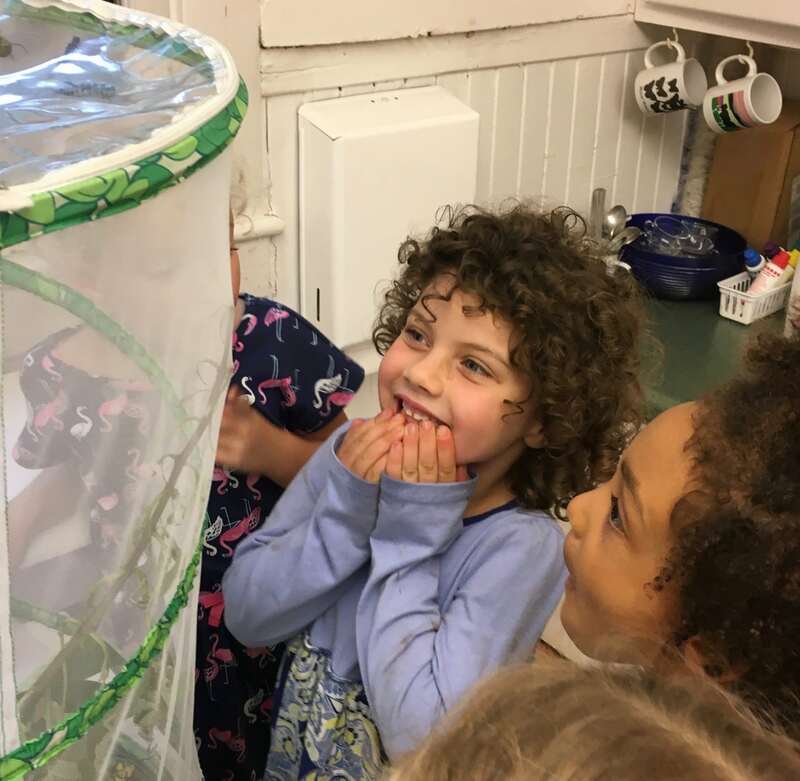 Caterpillar update: our 25 healthy, fat caterpillars have each gone into a chrysalis! The children were able to witness several caterpillars actually forming their chrysalis – a rare sighting in the classroom. The class has documented the egg, caterpillar and chrysalis stages. We expect our first butterflies to hatch next week. This too, we’ll document by careful naturalistic observation. Our trip to Magic Wings was great fun, and I send out thanks to Alex, Rachel, and Jennie, who were our parent drivers and chaperones. We had a wonderful time there! I’m having a great time with this class, and they are, too, with each other. 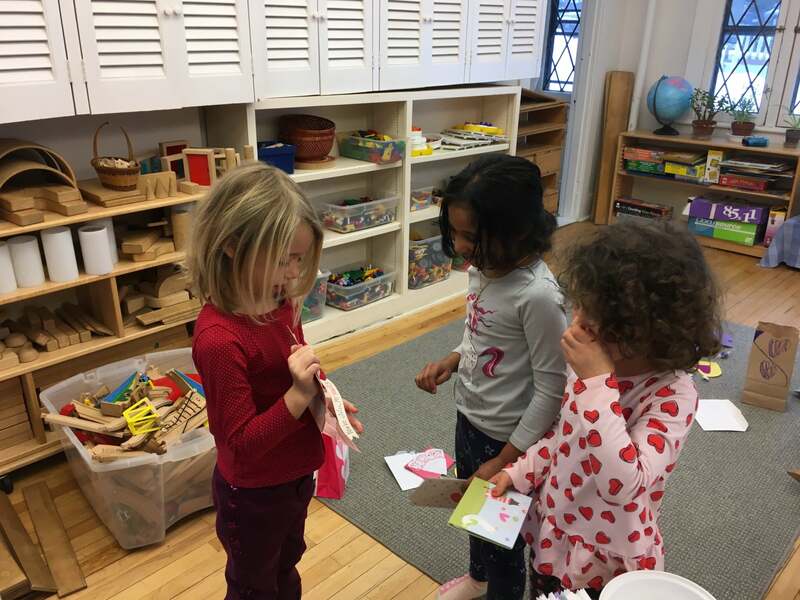 Earlier last week, during Inside Choice, play spontaneously arose where all nine decided to create an airplane. With great enthusiasm, they made choices: “Let’s fly to Paris!” “I’ll be a pilot!” “Me, too!” Others chose to be flight attendants or passengers. They used their rest mats to form seats and brought in food from the dramatic play area to serve to each other. It was so much fun that I promised to make time for some more “airplane time” soon. Who knows next where their imaginations will take them? I, for one, am eager to see! How this year flew by! Looking at the children today, I can vividly recall classroom life back in September and am so delighted with what I see in front of me now. 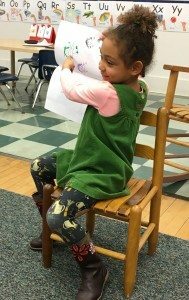 So much of their growth can be seen tangibly: there’s a whole raft of independent writers, most everyone has learned to zip their jackets, scribblers now make detailed representational drawings, and everyone’s counting skills have improved dramatically. Less visible, but no less impressive, is their emotional growth and maturity. We have had many discussions on surprisingly deep topics. They have twenty or more poems solidly memorized – beautiful and elegant words that now live inside them. They ask to hear Beethoven’s Fifth Symphony at lunch, and never tire of listening. They celebrate each other’s achievements and offer each other support in sad times. 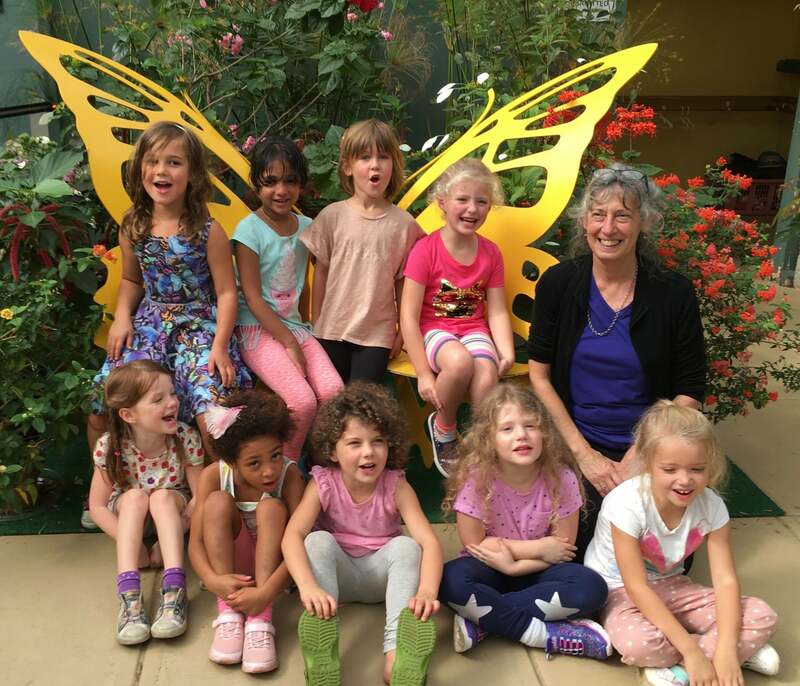 These children care for one another, and they’ve learned to take care of each other as well – a truly compassionate group. 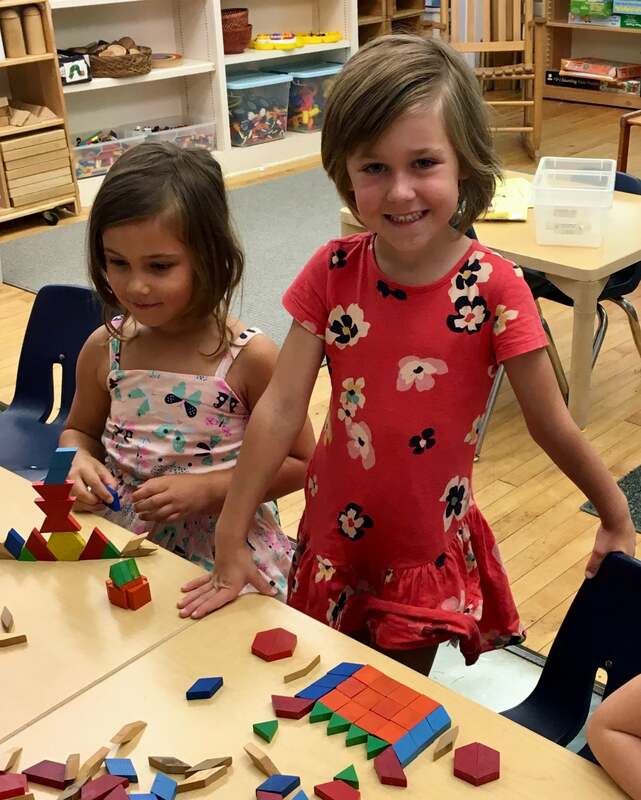 Here are photos of some recent classroom highlights: Mme. Daire brought her 8thgrade French students over to read stories they had written. Especially fun for me was to see former Kindergartners Anje, Aurora, Chase, and Keely reading to this current class! We make number sentences all sorts of different ways. These are interlocking tiles. We’ve practiced cutting with scissors all year. 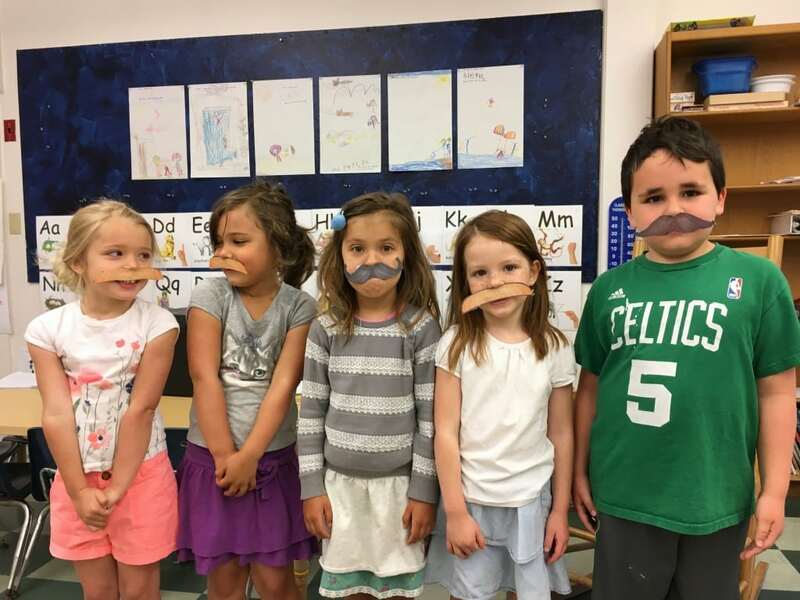 Look at those fancy mustaches! 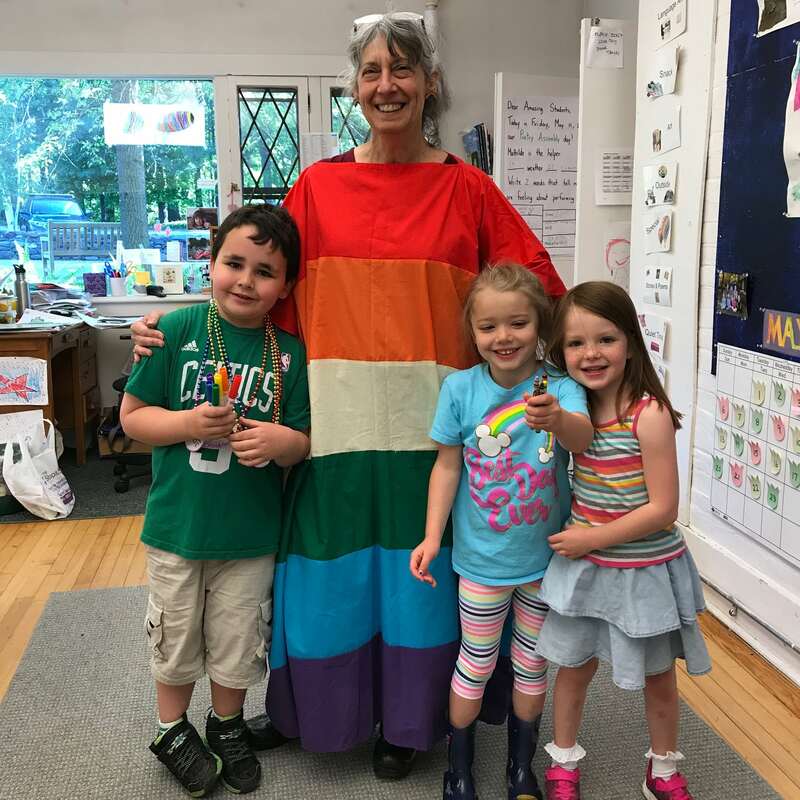 Rainbow Day was fun too! Writing continues to be a popular activity. 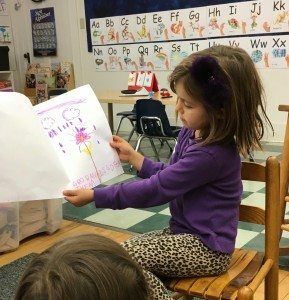 Lately the children have been writing books together, and then sharing them aloud with the class. Can this really be the last blog?? I’ve had such a fabulous year with your children. I wish all a wonderful and restful summer, and look forward to seeing you again in the fall! Though there are still occasional forecasts of snow, we, as a class, have thoroughly embraced spring. Preparing for recess, I am asked daily, “Ms. Patel, do I have to wear my jacket?” and there are groans of dismay, when, unfortunately, my answer is often yes. But once we’re outside and the children start running around, jackets, sweatshirts, and long-sleeved shirts get peeled off, and the children run and play with abandon. 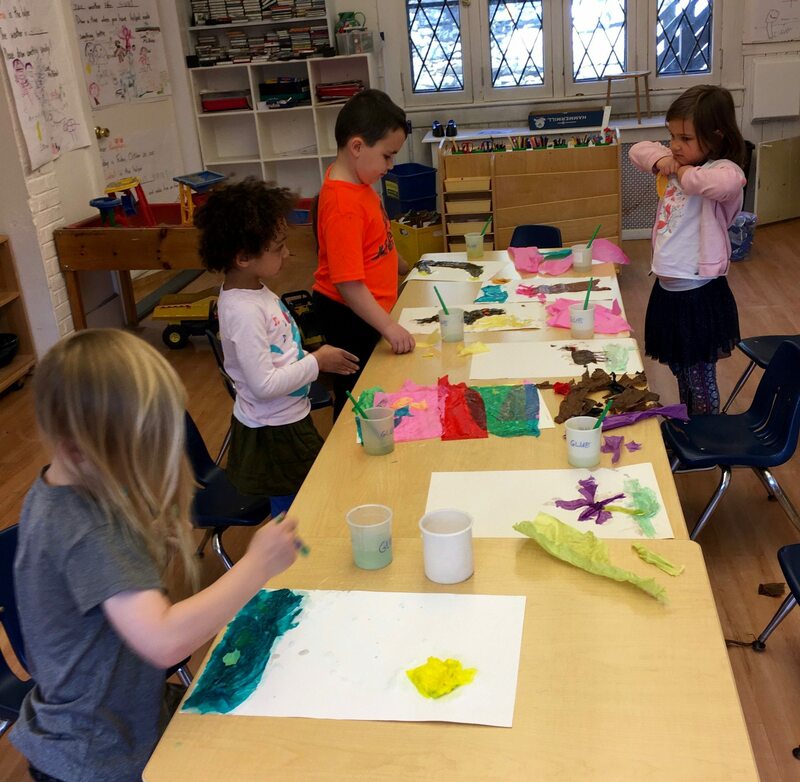 Inside the classroom, we can create spring no matter what the weather is doing. 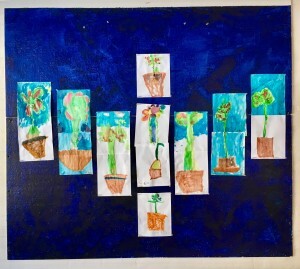 Come see our walls – the children have made beautiful artwork, using tissue paper collage, that depict spring happenings. 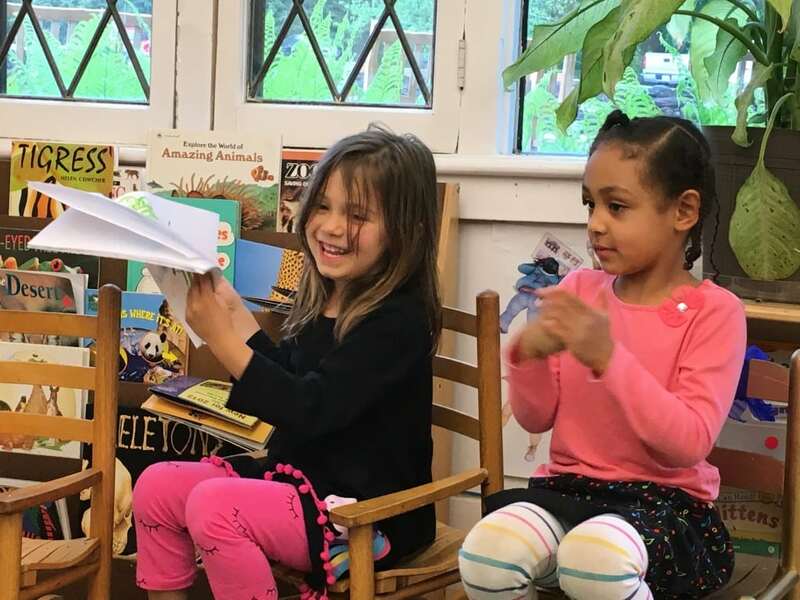 We learned two new poems this month, which you’ll hear at our assembly: Ode to Spring by Walter R. Brooks, and April Rain Song by Langston Hughes. We were very fortunate last week when Lisa Smyle, parent of a BCD eighth grader, came to our classroom. Lisa is an interpreter for the deaf community, and she taught us the ASL signs for the Langston Hughes poem. By the way, the class is working hard and enthusiastically for their assembly; you will be so proud of them! What else tells me spring is here? The children are taller, more capable, and more independent. They are confident in the classroom and on the playground. The connections between them remain strong, even when there are disagreements, and they have skills now to negotiate those times. 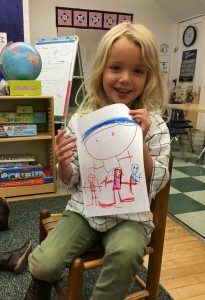 Classroom routines are internalized; they know what to do and when to do it. 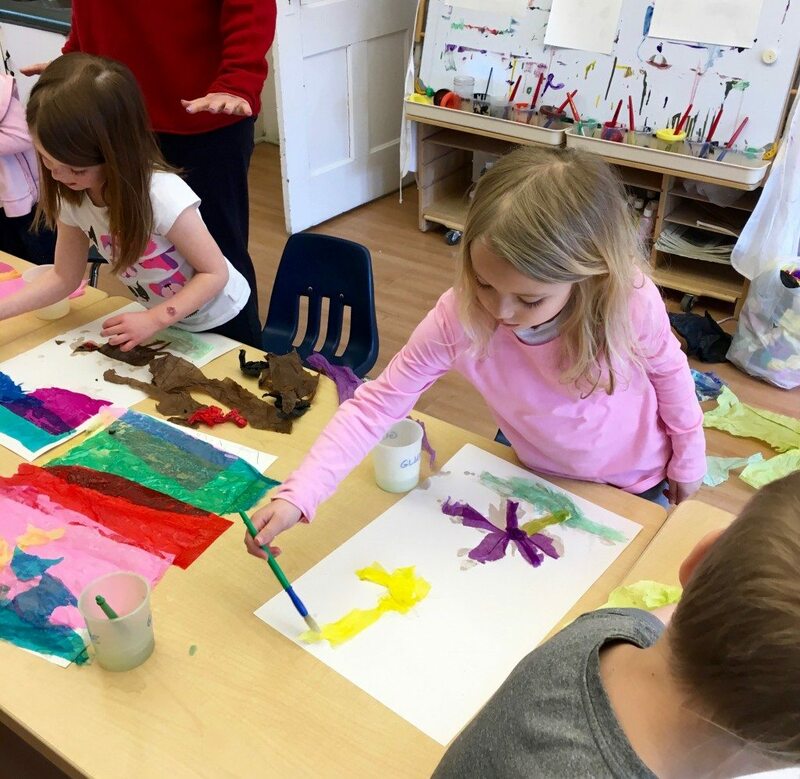 Spring is a good season in the classroom – the children’s curiosity, caring, and competence is evident everywhere I look. Other signs of spring: we will go on a trip this week to Hancock Shaker Village to see the baby animal exhibit. And in two weeks, we’ll hike in Kennedy Park for our annual Mountain Day. On both of these events, we’ll be joined by PK-3rdgrade. More information about these trips will come home in lunch boxes. I look forward to seeing you all on May 11 for the Poetry Assembly, and hope that all of you can stay for the Class Potluck Lunch immediately afterwards. All grandparents and special friends are invited as well. 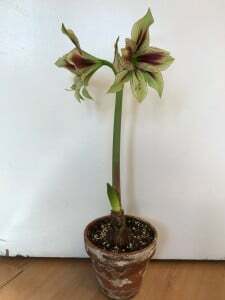 Some recent photos. Sorry that there are only two – I tried to upload three more, but this page wouldn’t let me! Antarctica – that frozen continent – what a wonder! Our class has been thoroughly entranced by all that there is to learn about this remarkable land. One question has led to another, as we’ve read about some of the explorers, learned about icebergs, and talked about which animals can survive there. With a focus on the specific penguins that live there (Emperor, King, Adelie, and Rockhopper), the children have learned each one’s identifying characteristics, their relative size, the different kinds of nests they make or the unusual way they care for their eggs. (On that note – ask your child to tell you how the Emperor penguins care for their eggs and chicks!) 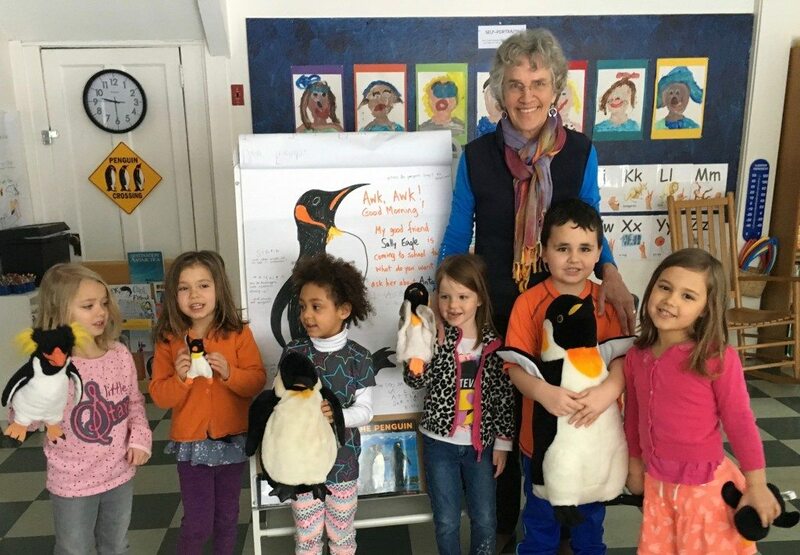 The children know that there are 17 different kinds of penguins worldwide, and that all but one live south of the equator (the Galapagos penguin is the exception). Ever wondered which animals eat penguins? Or why their backs are black and their stomachs white? 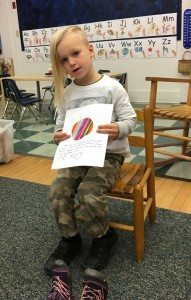 Ask your children – they have the answers! We had a real treat today when award-winning photographer Sally Eagle came to the classroom to share her slides of Antarctica with the class. Her photographs are vibrant and exciting and the children had lots and lots of questions for her about them. If you’d like to see some yourself, Sally, along with her husband Dan Mead, another award-winning photographer, currently have over 70 images on display at Kimball Farms in Lenox. It’s called “Focus on our World” and runs through April 10. Try to go! 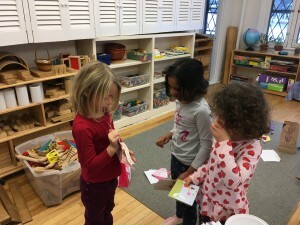 In other classroom news – Valentine’s Day was great fun! Alaska Day was great fun! 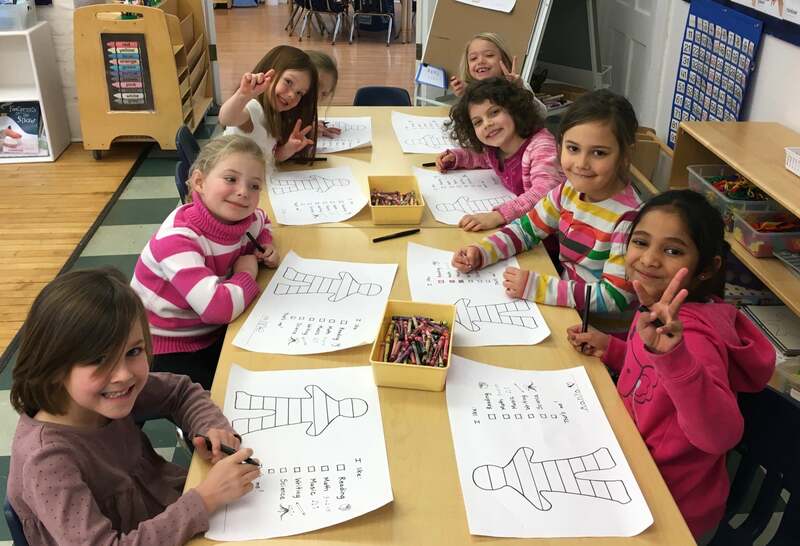 And next Wednesday will be the 100th Day of School – more great fun! February is filled with wonderful events! Making valentine cards for our families! That COURAGE makes the world a better place to be! 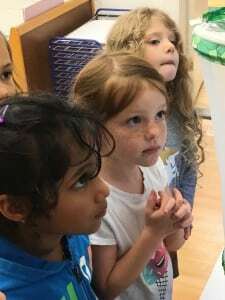 Based on the book Martin’s Big Words by Doreen Rapport, the children also thought about some of their own ideas to make the world a better place. These writings and drawing are hanging in the classroom. They are wise words from our little ones: “Stop fighting and get along together!” “Keep people warm!” “Help people who are hurt!” “People should stop fighting. Try to be nice to each other.” “Do not be mean to animals!” “I want people to make other people blankets.” “Say, ‘You are my best friend, and I love you. '” Now, if only they could get the world to listen…. We begin our study of BCD’s mascot, the Penguin, next week. Stay tuned – this is always an exciting unit! 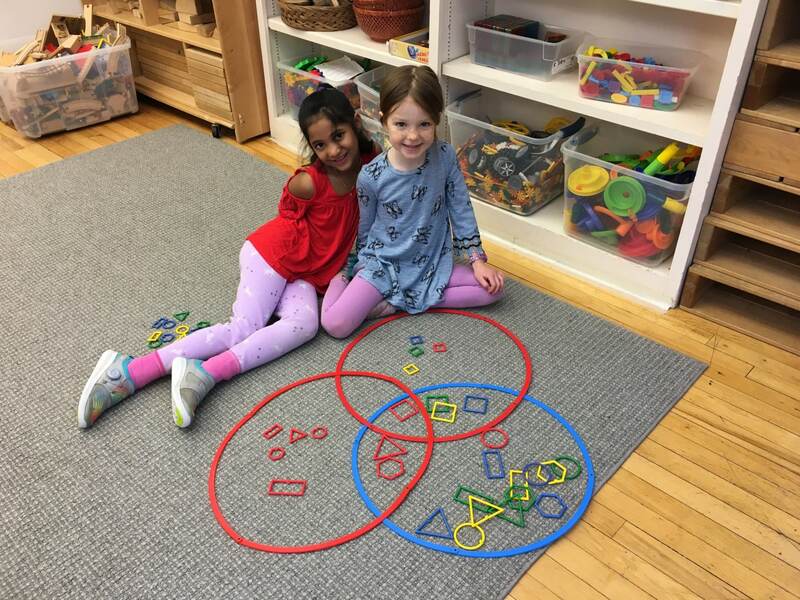 Have you seen the freestanding table loom in our classroom? 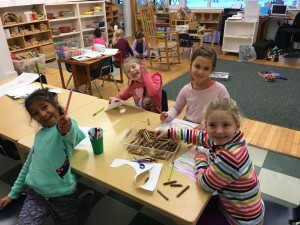 This weaving was begun six or seven years ago by the then-current class of kindergartners. Moving the shuttle over one string, under the next, over, under, and over again perfectly echoes the rhythm of the simplest of patterns we’ve been studying in math, an AB pattern. Over the years, every student in every class has added an inch or two to the woven piece on this loom. When completed (and we’re nearly there! ), this could become a small table mat, or perhaps a blanket for the dolls in the cradle. 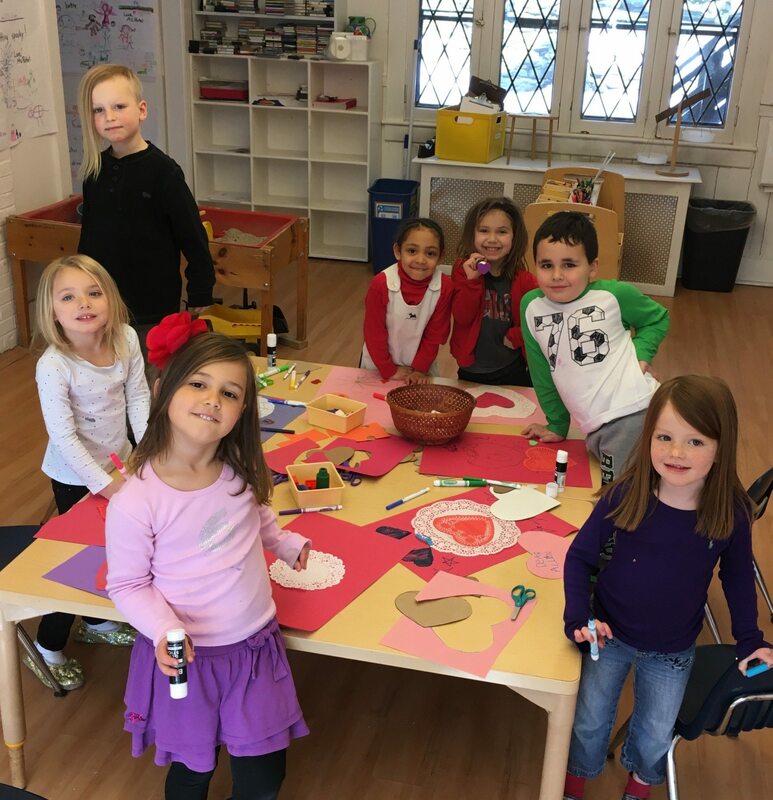 At this time of year, children are busy making gifts for their families. One of their holiday gifts is a woven potholder. The rhythm to make it is the same – over, under, over, under. Add a color pattern to that, and the potholders begin to look quite striking. Sometimes those color patterns get complex – for example, AABB – while still maintaining the AB pattern of construction. Patterns, symmetry, and balance are mathematical terms that also belong in art. 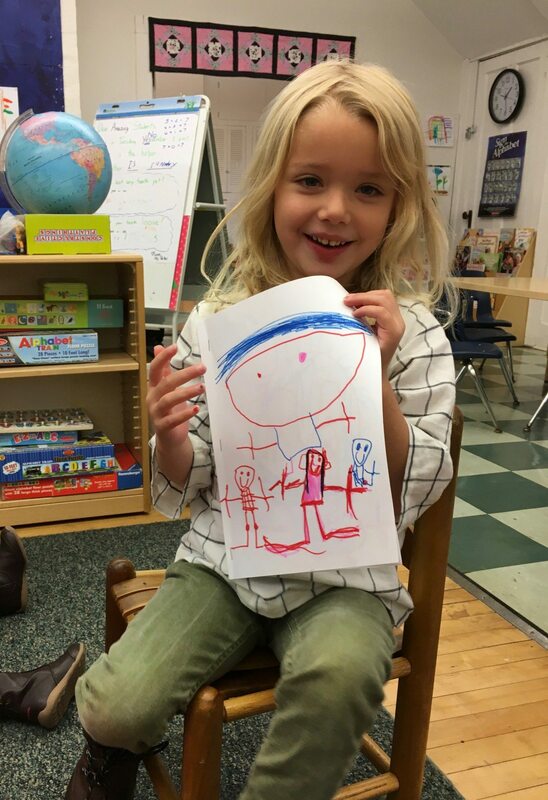 It’s exciting to see where the children’s imaginations take these concepts! We’ve moved the clocks back and the days are noticeably shorter. The air is crisp and heavier clothes are worn outside (reluctantly, I might add). Loudly honking geese fly over the playground. A new season is making itself known, and the children are quick to pick up on the changes. Inside, our learning shifts too. 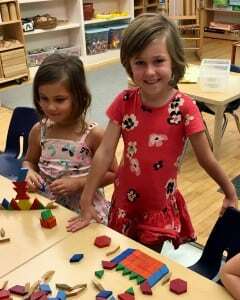 Now two months into the school year, the children are well acquainted with one another. 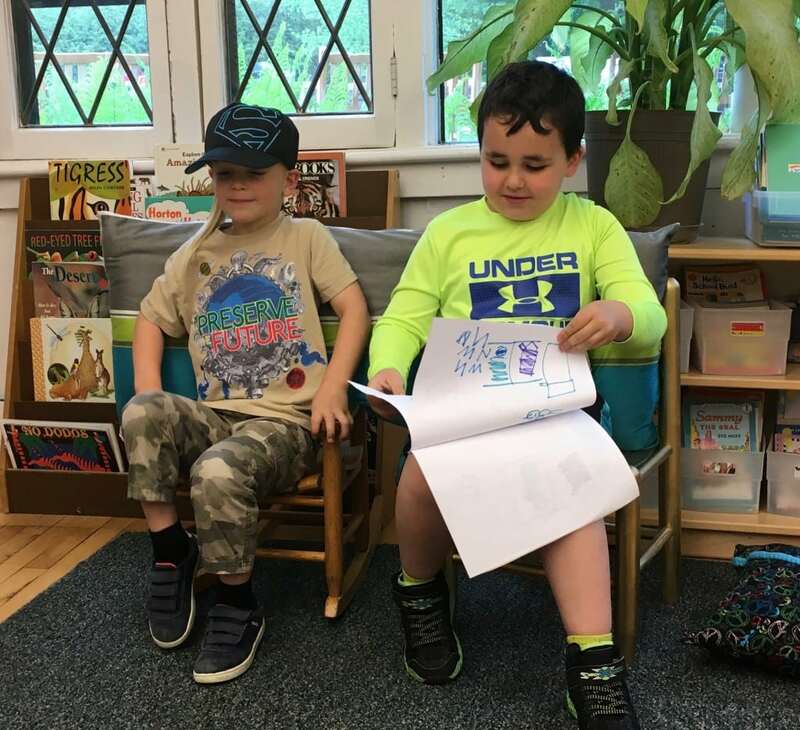 They swap stories and snacks and are gentle with each other when a classmate gets upset. 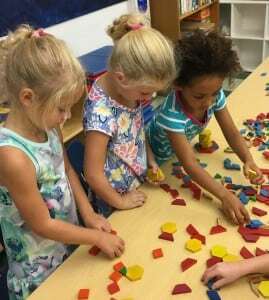 They’ve learned that our classroom is a safe place to try new things and that mistakes along the way are part of the package. Everyone is five now, and there’s a unity, an ease, that wasn’t there before. Just as the geese know when it’s time to start their journey south, things now happen organically in the classroom, too. At rest time, one student takes a clipboard and pens and writes his own version of a Frog and Toad story. At the end of rest, he asks, “Can I read it to the class, Ms. Patel?” “Of course,” I answer, and as he reads, the children listen, enthralled. The next day at rest, three take clipboards and make up stories. Some do their own writing, while others draw pictures and ask me to put down their words. These, too, are excitedly read to the class. 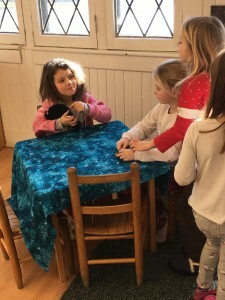 Then on the third day – magic! 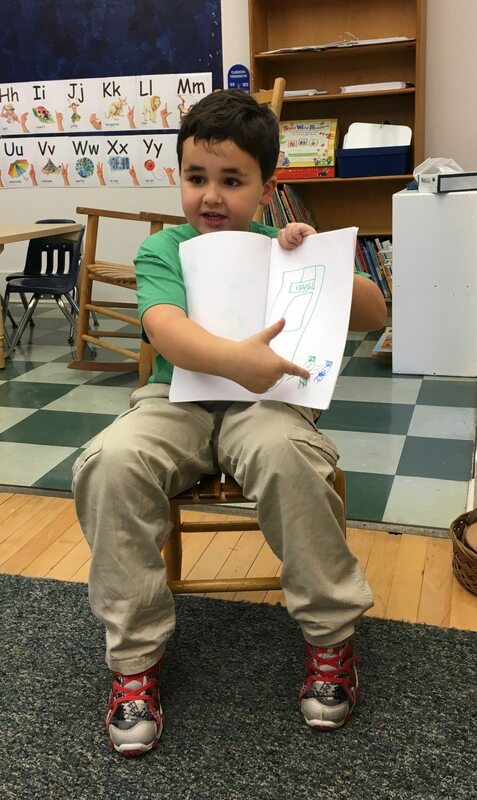 All seven have chosen clipboards and create stories that demand to be shared right away. I scrap the afternoon activity I had planned and we sit and listen to seven budding authors. Shy compliments abound at the end of each reading: “I liked your story. 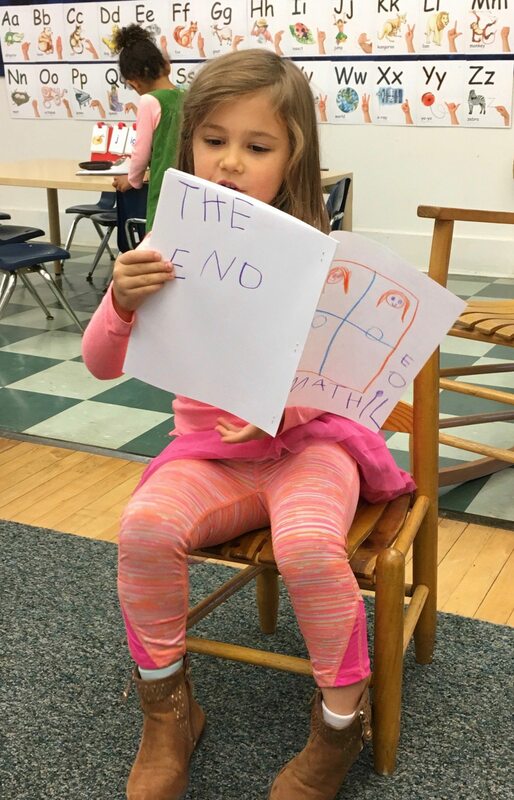 It was funny!” “I liked the colors you used.” “I liked how you wrote The End at the end.” As the children get more comfortable with the different skills of creating, sharing, asking for feedback, listening, I begin to ask questions of my own: “Do you want to give names to your characters? And what is a character, exactly? 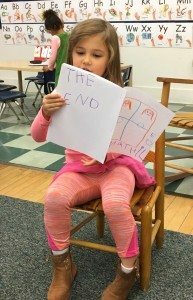 What do you think makes a story good? What makes it interesting? 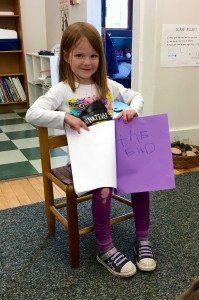 Do you have an idea for your next story?” The students’ excitement is contagious and the seeds of ownership of their own literacy are sown. It’s been extraordinary to watch this process, and it’s no lie when I say that never, ever before have I had an entire class writing stories so early in the school year. 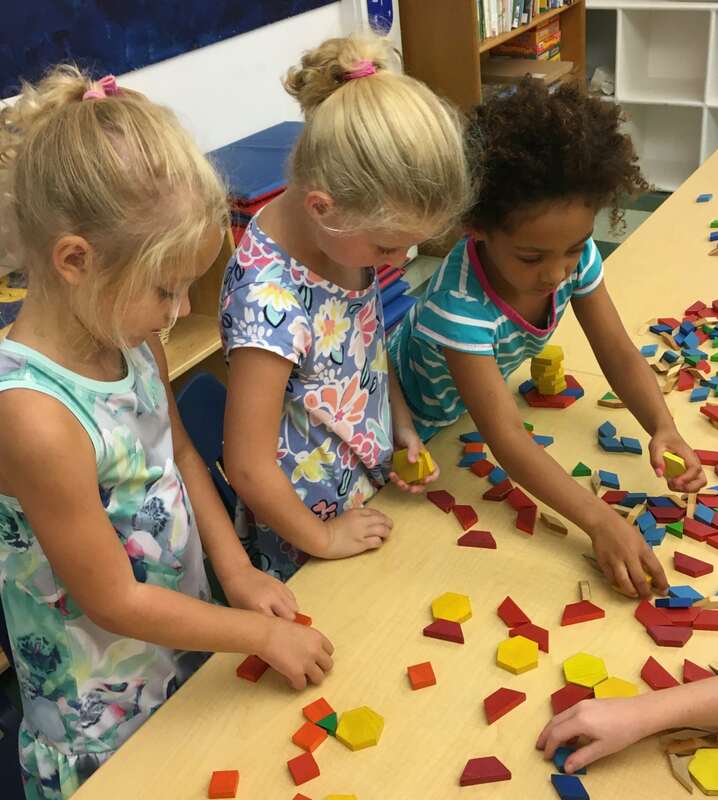 When learning unfolds like this, each child has the confidence to try out their ideas, knowing their efforts are fully supported. They are willing to be gently encouraged to reach towards the next level. They respond with their characteristic positivity. And so they grow. They are thrilled. So am I.